Featured blogger Hollis Lumpkin had quite a start to the first split of the duck season in South Carolina. She tagged a banded black duck from Canada and also, went hunting 3 times! 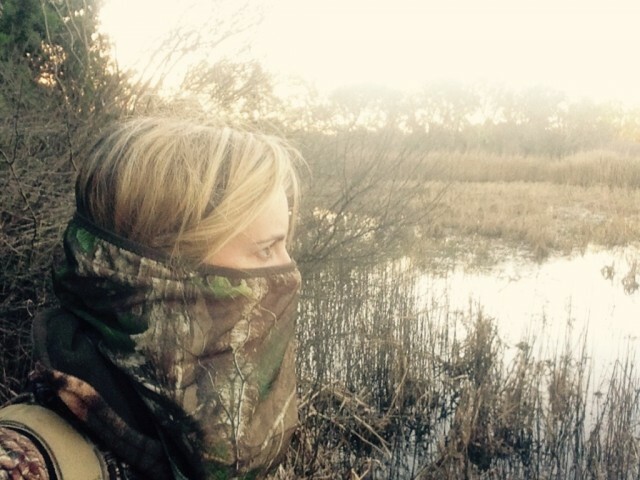 You may read all about Hollis’s duck hunting adventures at her blog, “The Bright Side of the Road,” which is one of our favorite, most positive outdoor blogs written by a woman. By 7:30, we had more than a few birds on the water, and the flights of ducks coming in showed no signs of slowing down. One tried to sneak across the pond and over our heads to the tree line, and I made a knee-jerk shot (mostly out of instinct) and knocked it down. John sent Prine out after it to retrieve, and noticed something interesting about the duck once he got it in his hands. A quick look with a smile told me all I needed to know – I’d shot a banded duck. This was only my second band, so I was definitely excited. Incidentally, the first banded duck I shot was also on an opening weekend, 2 years ago. Learn more about Hollis’s duck hunting trips.